Laboratorium aut Officina experimentis agendis est officina ad investigationes rerum naturalium parata, saepe in universitatibus aut scholis constituta. 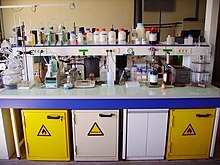 Laboratoria instrumentis et materiis bene ornata studiosis et investigatoribus maxime prosunt. ↑ Traupman, Ioannes. 2007. Latin and English Dictionary. Ed. 3a. Philadelphiae: St. Joseph's University. ISBN 9780553590128. Novissima mutatio die 9 Martii 2019 hora 07:30 facta.